It's barely been over a year since I reviewed "Sisters in Arms," the series premiere of Mysticons, and we've already arrived at the show's short-lived finale. They've been dropping like flies lately, haven't they? Sofia the First just ended last week, and Crazy Ex-Girlfriend is on its final run next month along with several other popular shows. Many of my favorite television series in the past have only lasted for two seasons, but they usually take some time in between for the writers to figure out where the story will go next. That, unfortunately, was not the case for Mysticons. 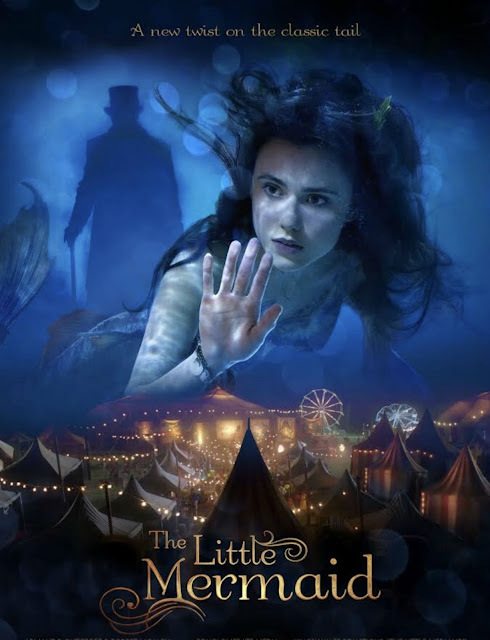 It jumped through two seasons containing a total of forty episodes with virtually no downtime in between, leading up to this weekend's series finale "The Age of Dragons." Before I start, I feel obliged to apologize that this review is coming out a bit later than I had hoped as Nickelodeon has always been very inconsistent when it comes to updating shows on their app, and I ended up finding the episode on Amazon instead. 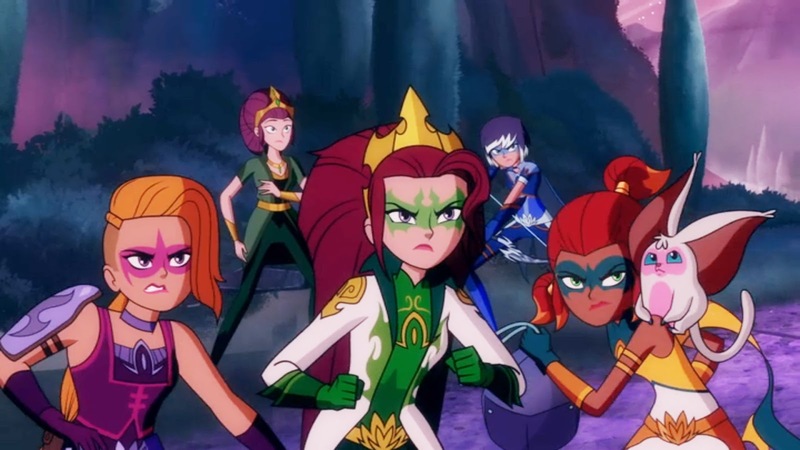 Even though Mysticons started out with a strong pilot, it has had somewhat uneven pacing from the second episode onward. 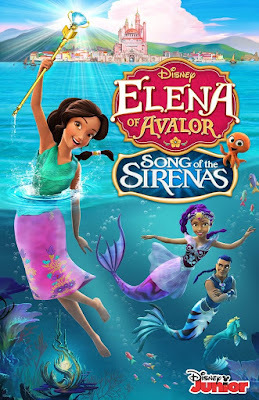 There are certain important emotional moments that get skipped right over, such as Malvaron asking Arkayna on a date, Emerald and Kasey's relationship switching from Em pursuing Casey to Casey pursing Em, Gawayne learning that Zarya is his new stepsister, Drake City's reaction to learning the identities of the Mysticons, and, most importantly of all, Queen Goodfey confronting Zarya for the first time upon learning that she was her long-lost forgotten daughter. All of these scenarios would appeal primarily to a female audience because they are purely emotional moments unlike the show's many action sequences, which have a wider appeal due to boys liking action and girls still relating to the all-female main cast. The reason for this focal shift, of course, hearkens back the show's origins, in which it was originally created about a group of male action heroes and was targeted toward boys. 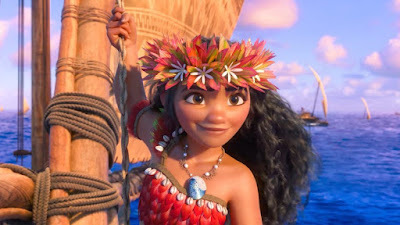 The shift in the series' direction when the cast was gender-swapped created the struggle of balance between action and emotion. 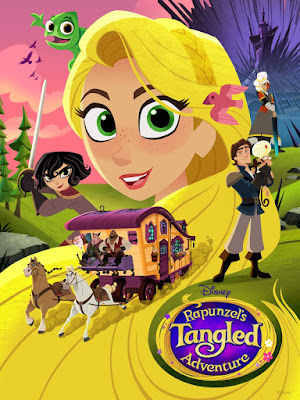 They wanted it to be an action show, but one that was female-oriented, hence the inclusion of princesses. Yet, if they made it too feminine, it would lose sight of its roots. I do admit that the weaponized style fihgint is at least a refreshing shift from some of the confusing sparkly "attacks" that you normally see in Magical Girl shows that have no intention of attracting an action-seeking male audience. Of the last set of episodes that have aired, my personal favorite was "Eternal Starshine of the Mage's Mind" because that was the only one that did not seem to shy away from or skip over the more emotional moments. It also provided some terrific closure for Proxima, who was almost a princess but wound up getting screwed over by some trick writing and then turning evil for a while as a direct result. In my opinion, Proxima had the best character arc on the show because it was so easy to relate to her loneliness and feelings of being unappreciated by her peers. I also loved that Arkayna admitted for the first time in that episode that she had a tendency be selfish and inconsiderate of others without always being aware of it. Even though she had a good excuse to act that way due to her tragic loss, she doesn't always set the best example for a modern princess. It was nice to see her finally put her differences aside and make up with Proxima, who was more than deserving of it. I was also glad to see Proxima fight off the mask of the Spectral Hand, as evil was never a good color on her. Mallory of the Vexicons was far more suited for the mask than Proxima ever was. The series finale, "Age of Dragons," saw some sibling rivalry for the first time between Arkayna and her newly discovered twin sister but long-time friend, Zarya. It was great that the king and queen got their bodies restored before the series was canceled because no one wanted to see it end in a world where Gawayne would stay king! Arkayna was understandably jealous of the attention that her mother gave Zarya, but I still missed seeing Queen Goodfey's reaction the moment when she first learned that she had another daughter who she forgot about because of a spell. Moments that got glossed over such as this one are what prevented Mysticons from being a great show instead of just a good one. I was still pleased overall with the conclusion of the royal Goodfey women's story, as they will now have the rest of their lives to form a healthy family dynamic. However, I feel that Arkayna and Gawayne displayed very little growth over the course of the show as Drake City's future rulers. Zarya's character arc was marginally better, thanks to her morality struggle as a former sky pirate. When I tweeted series creator Sean Jara about ending the show, he felt that it was a shame because they were "just getting started." It's true that there were several characters' backstories that remained unexplored, such as Malvaron's history with his evil sister Tasma, and the details of Piper's past and future. When the series began, she was my favorite Mysticon, but she became more of a comic relief than a main character as we spent more time learning about Arkayna, Zarya, and Emerald's families. At this point, I would have to say that Proxima was probably my favorite character in the show because her story felt the most complete. Even though the pacing was uneven at times, it was still a fun ride, and I'm glad I got to go on it. 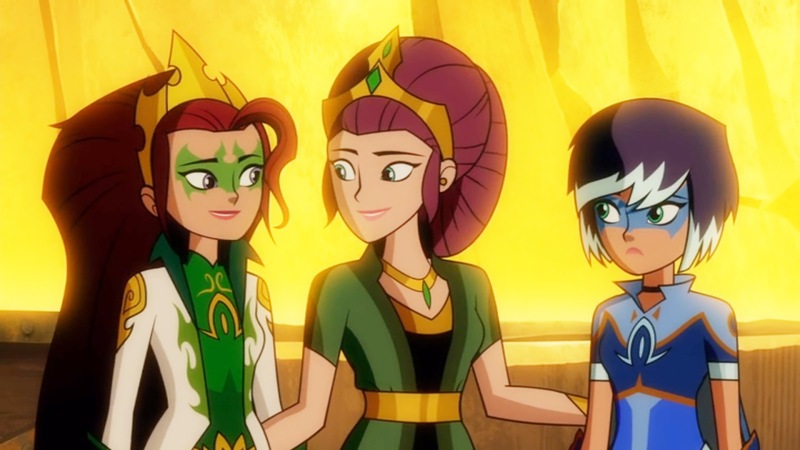 The final episode of Mysticons wrapped up cleanly enough to be satisfying while at the same time remaining open to future adventures, many of which are being continued in novel form. Long live the Mysticons! 1st, thoughts on the final ep of the show itself. 1. There was too much Gawayne, way too much Gawayne! IMHO there were so many better story ideas that either got shortened or shafted just so we could see that annoying Gawayne desperately needs his Dad to show even a tiny ounce of heroism. Me? I thought Mal should've just tossed him in the cave instead of chastising him and they should've forgotten him for the rest of the ep with only a tiny mention at the end if that was necessary. 2. It was fun seeing the Queen go into battle with the Mysticons but I wanted for Proxi and Mal to be participating in at least some of these battles too with the Mysticons, not stuck in a cave with dumb Gawayne. 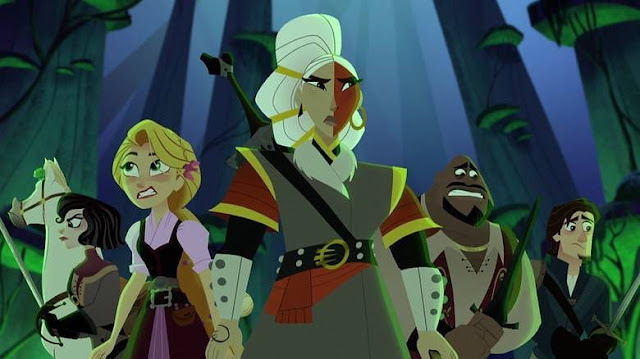 3.As for the Queen, I really wish we could've had scenes, even if they had to be very short, of her memory of Zee being restored (it was very choppy to have her be shocked at the end of the prior ep then confidently riding along with a daughter she barely knew the next) and meeting Proxi and perhaps having Proxi consider her as an honorary mom or aunt. It's nice that Proxi is now the leader of the Astromancers but I think having a family's love and support is something she'll still need in the future. 4. I agree wholeheartedly about Piper. She really got the shaft as this series progressed and it glaringly showed in this ep, especially at the end when Em, Kay and Zee were hugging their families while she just bounced around with Doug and Choko then Em, Kay and Zee got most of the ending montage narration with Piper only getting a short part of it. I almost hate to say it but probably being the little girl audience surrogate might have hampered Piper's ability to be developed quite a bit. It was late in the show, but after we learned that Necrafa was originally an elf a fellow fan wondered if Pipes might be descendant of hers. That could make for some intrigue if that were revealed and Piper either felt really ashamed about it, had to fight a really strong inner darkness or both and needed her sisters/bffs to rally around her so she could gain a bigger form of confidence and emotional strength. I really HOPE we get a good Piper novel sometime next year because there's so much mystery in her background that could make for great stories. 1. I will pull no punches, Nick really screwed this show over. THEY insisted that Sean Jara change the show's team and focus from boys to girls (though he seemed to be perfectly happy with that request). They moved the show to Nicktoons for its second season which, due to not being as widely available as the main Nick channel, caused the ratings to badly tank, gave the show very little marketing and were very inconsistent in posting new eps on the Nick website. As I type this, the last ep STILL hasn't been posted on the site. And it was crucial the new eps be there for viewers who don't get Nicktoons or who just prefer to watch the eps that way so that they could keep up with the show too! 2. 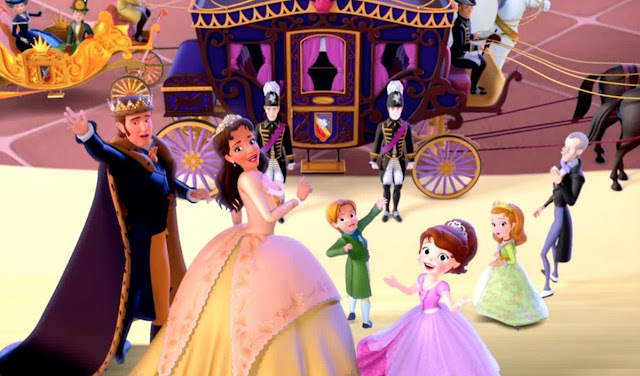 To compare it with a network darling's last ep, the last ep of Sofia the 1st was advertised a lot and got a double-sized ep with much fanfare. If only the last Mysticons ep could have been an hour long and had a lot less Gawayne! 3. On that note, would another network, such as Netflix, Disney or Hulu have done a better job marketing and maintaining the interest in this show? Disney would have been an interesting case because I wonder if they might have tried to shoehorn the gals into the Marvel Comics Universe. I like the MCU but not sure if I want to see Kay or Em hanging out with Spider-man or Dr. Strange. If Netflix, Hulu, etc. do pick up this series in the future, even just for reruns, it will be interesting to see if they handle this show better. Maybe, if that works as we would hope, we might get more new TV eps and maybe even a movie sometime in the future! (yep, that's very optimistic but I can't resist). 4. 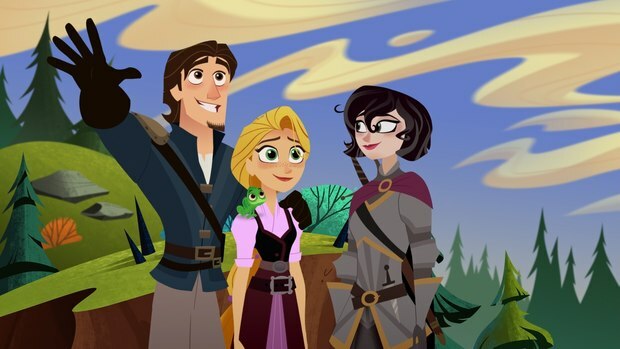 I still really hope that Sean Jara &/or perhaps other children's superhero team show creators will continue to make partially or better completely girl focused shows until hopefully the magic one that really gets both girls and boys interest happens and gets the great ratings and network support we would wish for. I realized I forgot to mention it in my 1st post (guess I was too possessed by Gawayne, LOL) but I was really ecstatic about Eartha's redemption. That was so great and could easily be my fave thing about the last ep. I'm glad they did allow her to embrace becoming fully good and even fight back against her evil sisters. We may not ever see it, even in future books, but it would be fun to have a story where Tazma frees the evil Vexicons from their prison (saw a recent post with a fellow Mysticons fan suggesting that and I thought that would be fun) and the Mysticons having to fight back against them with Eartha's help. You make some good points, especially about the network making the show impossible to find, preventing people from learning about it. 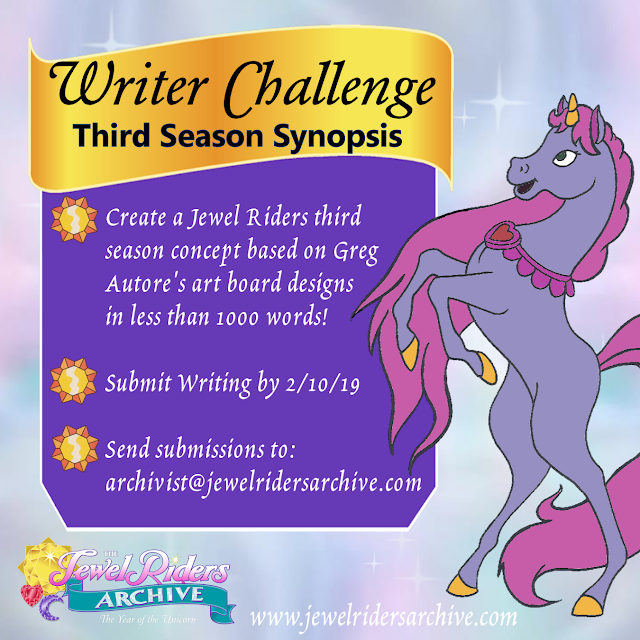 The same thing happened with one of my favorites, Princess Gwenevere and the Jewel Riders. It was never on a consistent time or channel, so nobody knew what it was. Another part I forgot mention that got skipped over in the series is how Drake City reacted to learning the identities of the Mysticons and how that affected their lives in the future. There were a lot of things that got set up in this show with no payoff. You're right about the ID reveal seeming to have no impact too! You'd think for having a reveal that big the gals would sometimes have to disguise themselves while in civvies to protect their privacy (something only briefly alluded to with Kay in the 1st graphic novel, which was really fun and I highly recommend). And you'd also imagine people would consider them famous and they would gather a number of fake friends based on that and people would make them want to be present for business openings, do wacky advertisements for all kinds of products, etc. I wouldn't be shocked if Sean and other show creators and writers had ideas along these lines and didn't get to pursue them due to the show's impending end. Hopefully they'll crop up more in future graphic and text novels because it could make for some great humor and drama. Well the Nick.com website FINALLY got the final ep posted in its Mysticons area (& it only took a month, AH-MAZING! LOL). At least it has a nice pic, with the 4 girls looking at the sky and smiling. Why couldn't I get a pic like that with my Google Play entry for this ep instead of having a lousy pic of Malvaron chastising Gawayane? The Google Play thing is totally embarrassing! It's the last ep of the show. Can't we have at least 1 of the heroines in that pic, if not say all 4? And Gawayane is just a comic relief foil/hate sink. Having him be in that last pic should not even have been considered. I think the MYSTICONS Tv show should have a place on Cartoon Network. They had a successful run of luck and success with bakugan, I think the MYSTICONS cartoon would be a perfect fit for Cartoon Network whether with the MYSTICONS Cartoon or a reboot of MYSTICONS. I think it will work out well. And while I am a huge fan of the MYSTICONS cartoon, I think the Cartoon Network airings of MYSTICONS can inspire them to make a cartoon network exclusive reboot of MYSTICONS. I think all MYSTICONS fans will be happy about that. If cartoon network can pick up MYSTICONS and air two episodes of MYSTICONS every weeknight at 9pm, that would be great! I personally would love to see that. Nick's problems seem to mainly stem from the fact they are a very distant 3rd to both Disney and Cartoon Network. But if Cartoon Network or even Disney, Hulu or Netflix, were to pick up Mysticons, it might have the chance of getting the stronger publicity and ratings it deserves. I appreciate that Nick helped produce this show but they are so desperate for immediate big hits they have no time or patience to let a show like this build an audience over time so I'd hope a network that's doing better in general would be able to do this. As a sad footnote though Nick's website has moved all of its content into smartphone apps so the only way to easily view any Mysticons eps for free is to go to YouTube and look for the still posted full 1st episode. I uploaded this app on my tablet to test it and I would say it's pretty good but not great. It's a bit awkward to use and now only has season 2 eps of this show and some short clips from season 1 eps.